The year 2010 is coming and we’re analyzing the mistakes of the past year. I would like to show you three rook endings that were played by strong Grandmasters. 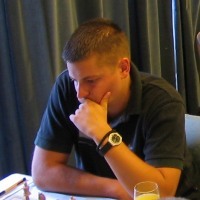 The first ending appeared in the game Aveskulov-Moiseenko from the Turkish Team League. Our game was the last and the outcome determined the match result. Next endgame (Tregubov-Akobian) was played in the recently finished World Cup in Khanty-Mansiysk. In the end I am going to show you another game that had an extreme sporting value (Gashimov-Stellwagen). I hope my analysis will stimulate our readers to bone up on rook endgames in order to avoid the same mistakes next year. Merry Christmas & Happy New Year to everyone! The feather is formed by pawns c4-d5-e4 for white and c5-d6-e5 for black. This kind of pawns structure arises from openings like King’s Indian or different type of Indian openings. In the previous article about feather pawn structure we have seen game Bent Larsen – Bobby Fischer and white’s plan to push b4 without previous a3. In the following example from Polugaevsky – Geller, Leningrad 1962, white took a more careful approach with a3-b4, doubling rooks on b-file and only then push a4-a5. The Chessdom Chess Academy (CCA) is a new state-of-the-art chess training central. Independently of where you live, you will be able to acquire top chess preparation on the internet. The CCA offers training with professional coaches and latest software products that is available to you without leaving your home. We would like to introduce you to the improved CCA, now with different levels to meet the specific needs and wants of the students. Each level is divided in sublevels concentrating on different areas such as tactics, openings, endgames, technical positions and other elements of the game. We managed to upgrade the Academy with the help of two important features. Second, we are now able to use the Chessdom Chess Shop, and our students will be trained with the most recent and state of art software products available. The latest versions of Rybka, CT-Art, databases, and chess books will be used during the courses. 1. What is your ELO? 2. Do you require any specific training or general lessons? In order for you to get the most of your time with CCA, it is very possible that you will be assigned one coach or a combination of coaches. There is also the possibility of 1-on-1 lessons or group teaching. Individual lessons cost 14 eur/hour, group lessons cost 65 eur/month and include 16 hours of training plus additional individual work. All CCA students receive a special 10% discount at the Chessdom Chess Shop. When I was first introduced to Omega Chess, I spotted immediately that while all the elements of chess are preserved, new tactical twists are created by the extra pieces, larger board and extra corner squares. The Wizard and the Champion complement very well and quite entertainingly the different strengths of the Knight, Bishop, Rook and Queen. But even I was not prepared for Omega Chess’ mushrooming in popularity – it is a spectacular hit among teenagers, Omega Chess groups have spawned in places as diverse as Toronto, New York and Budapest, and internet technology has brought us the Omega Chess java script game sample player, and the Omega Chess play-by-email server. Omega Chess, whose evolution is based on what already works, features a 10-by-10 board with 4 extra corner squares (104 squares in all) and two new chess pieces, the Wizard and the Champion, which combine unique and exciting elements of the other pieces, to form a super-tactical game which will improve your standard Chess ability! On the 10-by-10 board, the Champions line up next to the rooks. The Wizards start in the extra corner squares, one square diagonally behind the Champions. The Champion, like the Knight, is classified as a leaper. It can move one square forward, backward or to either side. Or the Champion can jump two squares forward or backward or to either side, or jump two squares diagonally in all four directions. The Champion can jump over pieces and it can control up to twelve squares. The Wizard is also classified as a leaper. It can move one square diagonally in all four directions. Or, like an exaggerated Knight move, the Wizard can jump three squares horizontally or vertically and then one square to either side. The Wizard is bound to the color of its starting square. The Wizard can jump over pieces to also control up to twelve squares. From its initial position, a Pawn in Omega Chess can move one, two or three squares forward and after that, only one square at a time. A Pawn cannot move one square initially and then two squares afterward. When making an initial double or triple move a Pawn cannot jump over other pieces. While Pawns move directly forward, they can only capture an opposing piece by moving one square forward diagonally. After checking out the Omega Chess website, you might want to note the following, just so that, in your first game of Omega Chess, you are not just mated immediately!? The Scholar’s Mate in chess (1.e4 e5, 2.Bc4 Bc5, 3.Qh5 Nc6?? 4 Qxf7 mate) has a direct parallel in Omega Chess. Using the Omega Chess notation this checkmate runs 1.Pf4 Pf5, 2.Bc4 Bc5, 3.Qj5 Ng7?? (defending the pawn on f5) 4.Qxg8 mate! The message here is quite clear – you still better defend your king’s bishop’s pawn! An interesting point here is that a reasonable move after 3.Qj5 is 3…Ch7 (Champion to h7) – as the Champion can move two squares diagonally, it attacks the White queen on j5, defends its own pawn on f5, and blocks the queen from attacking the sensitive king’s bishop’s pawn on g8. However, after 4.Qg5, for example, don’t overlook that the Scholar’s Mate is still being menaced, as the Champion does not move in a one-square diagonal, so there is still no protection for g8. But 4.Qg5 is not objectively strong, because Black can now play 4…Ng7, and, much like proper defense against the Scholar’s Mate in chess, in Omega Chess, White will suffer because the queen has really been brought out too early.As far as a parallel to the classic Fool’s Mate (1.f3 e5, 2.g4?? Qh4 mate) goes, Omega Chess has this feature, although it would take a lot longer – for example [Omega Chess notation] 1.Pg2 Pf5, 2.Ph3 Nc7, 3.Pi4?? Qj4+, 4.Ri3 Qxi3+, 5.Ch2 Qxh2 mate!However, Omega Chess has its own distinctive Fool’s Mate: 1.Wa2 Ng7, 2.Wb5 Ni5?? 3 We6 mate!! as the Wizard with its elongated knight qualities checkmates the opposing king entirely on its own. But let’s see a concrete example to understand better. I will show you the game Spassky – Petrosian, from the 1966 World Championship. If you are interested in raising your chess level, don’t miss the weekly free trial lesson with IM Miodrag Perunovic that is taking place today on the Internet Chess Club (ICC). Together with IM Kalin Karakehayov, Miodrag is leading teacher at the Chessdom Chess Academy. The latest success of his students is WGM norm and 54 FIDE points gain for young Sandra Djukic, earned at the Serbian Team Championship. The lesson is taking place at 16:00 EST / 22:00 CET, be there on time! All you have to do is to login to the ICC and message TheButcher-Mio (Miodrag’s convenient nickname), and he will guide you through some crazy attacking positions. If you don’t have ICC account, sign up for free trial. Chess players all over the world are becoming enthralled by Omega Chess, the new hyper-modern variant of Chess which is rapidly growing in popularity. As a Chess Grandmaster, there are many things that immediately attracted me to Omega Chess. It offers all of the intrigue and fascination of traditional Chess while at the same time adding new dimensions of interest. For starters, the larger battlefield provided by the expanded board (10 by 10 squares) allows the two armies more time to assemble their forces before going into battle. This allows tremendous variation in terms of planning and strategy in the opening. This new range of possibilities makes it much less likely that opening theory will conquer Omega Chess, as it has traditional Chess. The two novel pieces of Omega Chess, the wizard and the champion, play their own unique roles. It is interesting to note that since both of them can jump, there are now three different “jumping” pieces: the knight (from traditional Chess), the wizard, and the champion. The wizard is particularly lethal, being similar to a knight but having become almost a long-distance piece! No description of Omega Chess would be complete without mentioning the enigmatic extra square in each corner. A king can potentially hide there and build an incredible shelter around itself, while being immune to attack on any rank or file. On the other hand a bishop could entrench itself there and play the role of sniper against invading enemy forces. It deserves further emphasis that regular Chess has a major problem: the memorization of opening variations. This defeats the entire purpose of Chess, which is to think for yourself and do battle using your mind. Instead, many modern games, including some of the top- level games in the world, are won or lost with the winner not having to make a single original move, the entire variation having been memorized beforehand. Omega Chess solves this problem perfectly, as all known Chess opening theory is useless in Omega Chess. To summarize, the new possibilities offered by Omega Chess are astronomical. Being full of exciting, new, uncharted territory, Chess players can apply their creativity and existing Chess skills to the game in full, without being burdened by memorization of long opening variations, something that has plagued traditional Chess for several years now. In short, Omega Chess strikes a perfect balance between keeping the benefits of traditional Chess and offering a beautiful new landscape of unexplored territory. The Chess world has been hungry for a new form of Chess for a long time now. Even some of the greatest players of all time, like Fischer and Capablanca, have suggested adding new dimensions to the game. For all of these people, as well as the next generation of Chess players, Omega Chess is the answer! I have no doubt that Omega Chess is the natural result of Chess evolution, and is the right way for Chess to enter the 21st century. In the next game, white doesn’t do seriously strategical errors, but just some small tactical inaccuracies, which were enough for black to take initiative on kingside and to create powerful mate threats. I am talking about game Larsen – Fischer, game 4 from candidates match, 1972. The game started as a King’s Indian, one of the favorite openings of Fischer. In initial position both sides dispose of a compact mass of eight pawns. The strength of this compact mass of pawns is given by its mobility. For every chess player that understands pawns power, the fight for creating a “center of pawns” is extremely important. This concept created by Steinitz is an element of first importance, Grandmasters try to use it in every of their games. Most characteristic case of flank phalanxes is made by pawn formation “a, b and c” against formation “a and b” or “a and c”. There is a lot of theory about these pawn structures and usually its considered to be an advantage to have 3 pawns versus 2 on queenside. But things are not so simple. Just having a flank phalanx doesn’t mean we won the game. Everything depends on concrete aspects of the position like open files, mobility of pieces and in endings activity of kings. And since these positions can appear very often in practice from many openings, I will show you how to make correct plans in order to obtain advantage. As example I will present you a game between Marshall and Capablanca from 1909.